Not that I'm complaining, but here lately, the past couple of weeks especially, The Metal Bikini has almost been a full-time job with all the reveals, the new relationship between me and Miniature Market, and all of your emails, comments, and G+/ Twitter shenanigans. Again- this is a good thing. Hells bells, it's a great thing actually as I still have a blast talking X-Wing with all of y'all and writing these articles and everything. That said, there is a downside- I get wrapped up in so many different things, I sometimes forget stuff. Case in point, a nice French guy that goes by oopinou sent me a link to a card creator he'd been working on awhile back. I'd meant to check it out, then got busy with everything else. Everything in HD and directly convert to a PNG file allowing the user to download it and print it very easily. Sharing is available too, and some "template" of ships can be selected to save a few time. This tool was thinked to be easy and fast to use, an i will take all suggestions in consideration. It is only in French for the moment, BUT, it is very easy french, and the texts actually are not very needed. First, I'm not correcting anybody's mistakes, man. Your English is better than mine about half the time, bro. As I've said before, I work with a bunch of Japanese dudes who get all embarrassed because they don't speak English very well. "No," I tell them. "Your English is much better than my Japanese." You get your point across and we're good as far as I'm concerned, and that's for real. I'm not going to make fun of anybody or get uppity about the language when I can barely pull off saying "Thanks" in more than a handful of languages. Hell, English is a mongrel language anyway- we got how many words to convey basic concepts like agreeing with somebody? That's nuts- you don't need to know them all anyway. Secondly, how awesome is this thing? My God! You can set like friggin' everything with this guy's generator! I got on there earlier to mess around with it a little bit before I wrote this article and before I knew it, 30 minutes were gone. 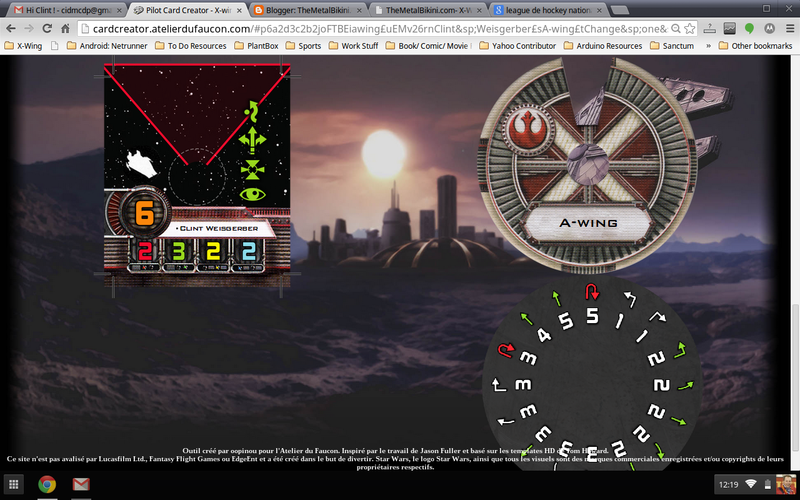 I swear, customizing X-Wing Miniatures cards is almost as fun as completely tearing down and redesigning my Moto X's screens. And yeah, I mean that as a compliment. It's probably no surprise you can change the actual text for the ship, pilot, and card, but you can even pick stuff your little ship icon deal, you can pick different firing arcs (normal, front and rear, 360) for your Primary, pick your upgrade bar icons (including multiples for Missiles, Torpedoes, Crew, etc. ), pick your Action bar icons, your Pilot Skill value, your Faction, you name it. You can even make a "dotted" unique pilot! Heck, it even takes all the options and stuff you pick and suggests a point value for your creation. Comprehensive, I think is the word you're looking for here. Now, I don't speak French, but I do watch hockey, and sometimes that means I'm watching La Ligue nationale de hockey, rather than the National Hockey League, and since I had a couple of years of Latin back in the dinosaur days of high school, I can somewhat stumble my way through a little bit of French. That said, as oopinou mentions, you kinda really don't need to know French to get some good mileage out of his generator. 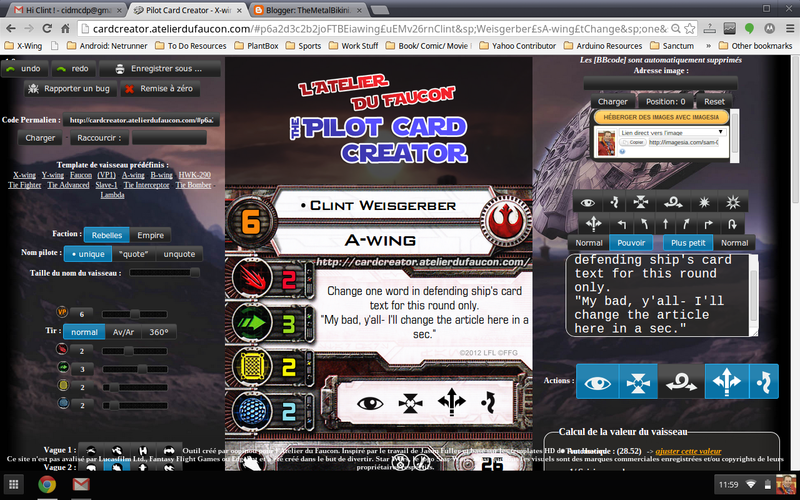 Just experimenting with typing and clicking along with a bit of familiarity with X-Wing Miniatures cards gets you quite a long way. But wait there's more- this isn't just a card generator, it also generates your maneuver dial and the little square base insert thing with your firing arc and main stats and stuff! How awesome is that? That's just crazy impressive to me. I hope it is to y'all as well. Now we can make Bikini Squadron, y'all! Aficionados report in! Thanks again oopinou! Er, I mean, merci oopinou! Your card generator is tres magnifique!